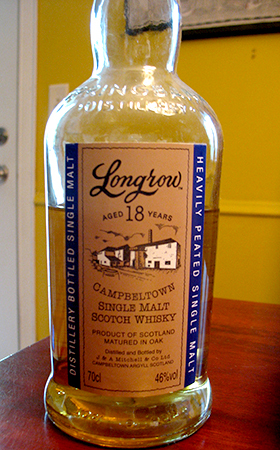 I’ve previously reviewed a Longrow 18 released in 2011. This one, released in 2008, was the first of the Longrow 18s, and along with the Longrow CV, which was also first released in 2008, filled out the range of Springbank’s double-distilled, heavily-peated malt (the 10 yo and 14 yo had already been released in prior years). It was very well received on release; this is my first time drinking it and I’m very interested to see what its like. This is another of Springbank’s double matured wine cask releases, albeit for their Longrow line of peated malts.I’m usually a little wary of red wine finished whiskies but, as is usually the case at Springbank, this is closer to a double matured whisky: it was distilled in 1997 and spent eleven years in refill bourbon casks and then a further three years in fresh Burgundy casks. That and the fact that Springbank’s distillate is by its nature robust emboldened me to purchase it after release. I opened this bottle quite some time ago for one of my local group’s tastings and my notes say I liked aspects of it but found it a bit clouded by sulphurous notes. Since then it’s sort of got lost in a corner of my whisky lair and despite having planned to review it a long time ago (hence the picture taken in a different season) I’ve never actually gotten around to it. Well, here I am now and I hope those sulphurous notes have abated a bit, as sometimes happens. 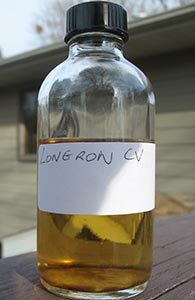 The “CV” was the NAS entry-level Longrow (Springbank’s peated line) until recently when it was discontinued in favour of the new “Peated”. The CV was much beloved and there was the requisite gnashing of teeth at the news. It is not very clear to me though if more than the name has changed (I am clear though that I have not bothered to check–if you know one way or the other, please write in). It’s entirely possible that in a market where peat is king, Springbank felt the need to more clearly signal to the masses that they make a heavily peated whisky (after all, all Longrow is peated, so that description is not particularly unique to this release). Then again there may actually be a difference. Luckily, the price is not very different. Nose: Austere, briny, flinty. Whiffs of gunpowder, and also something sweet and organic (farmy). Not so very different from the 14 yo. Gets more minerally with time. With more time the farmy/peaty note gets rounder and comes to the front. There’s some apple peels in there too now. A drop of water brings out some lemon/citronella, and some menthol too. Later there’s some sweeter fruit in there too, but I’m having trouble picking what it is–oranges dipped in salt, maybe (do anyone other than Indians eat oranges with salt? I’m sure they must). 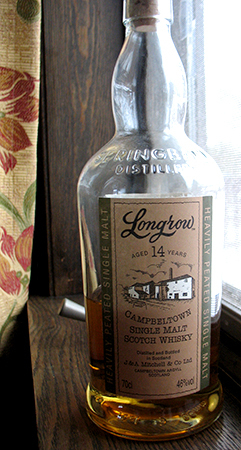 Longrow is the name of the “heavily peated” whisky produced at the Springbank distillery (Hazelburn is the unpeated and triple-distilled whisky produced there). I put “heavily peated” in quotes because even though those words are on the labels, I’ve not found the 14 yo or the 18 yo I have tried to be particularly heavily peated, and the same is true of the few sherry/wine cask Longrows I’ve tried; of all the (not very many) Longrows I’ve tried the now-defunct CV was the smokiest–I have no idea if its replacement (the “Peated”) is as smoky or more/less.